Indian mythology is replete with interesting stories and heart touching episodes of love. Love with its various hues is exquisitely portrayed in all stages of Indian history as heady, passionate, sweet, cute, amorous, tender, gentle, exciting, divine and so on. Consequently, so many different words have been used to describe the various shades of this emotion. Any of these lovely, mesmerising words will make a perfect choice of name for the tiny bundle of love you have brought into this world. A name with such an ethereal meaning would truly be your most precious gift of love, meant to last a lifetime, for your little one. With Valentine's Day, Love is in the Air! 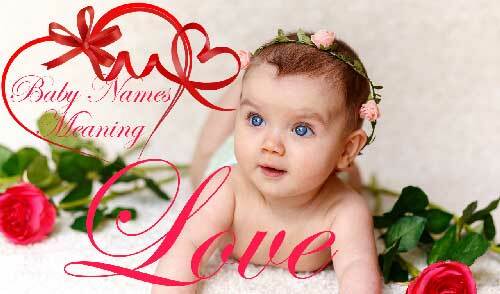 So we thought why not give you list of Indian baby names with meanings related to love. Please take inspiration from these gorgeous boy and girl names to find your own love-ly name. Looking for a name with a beautiful meaning, What could be more wonderful meaning for a name than a lover, on this Valentine's Day? You will find a name that is not only cool, but also meaningful in our list of baby boy names that mean love.